MIFI powered via a solar panel / battery? Do you know how much Open reach charge for a line install? We got a quote to have one put in. The nearest connection point is 550 metres away. The Gov give them �3k to put a house online. They wanted �13k from us to in stall it above ground via poles. I was not sure if that was Plus or inc VAT but either way it was too much. If we laid the (supplied) pipe they would do it for about �6k but it had to be in a straight line. Impossible to our location. at a slight tangent but if there is coverage would 4g wireless do the job? Try a MiFi with a direction antenna. Our speed went from 1-3mb to 25-50mb with no other changes. I had a newly registered address on building plot, but as BT hadn't updated their database with RM database, I didn't exist and wasn't getting anywhere with BT. 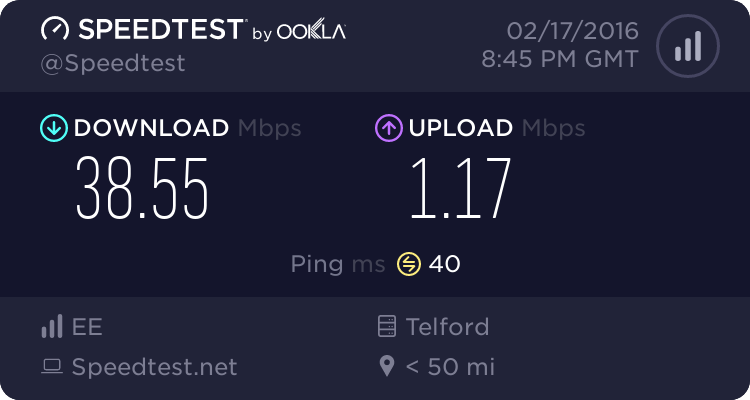 So when EE cold-called me, I said "I'll have your broadband if you can get me connected". I guess she was working on commission and fiddled the system (used neighbours address) to get my application past the computer that was saying no. Before my address was registered I did the same with my electric connection - got a cold-call and got them to sort it out.. Anyway, I know you can't contact Openreach direct but I don't suppose there's any mileage in having a chat with a local BT engineer when you next see one about? There often can be. They may know how to play the system to get broadband by one means or another. As far as postal addresses/post codes are concerned, event he police want one if you report an incident. I rather suspect if you were reporting a dead body, they might be able to find it on a map though.